Chronograph Marius Favre & Co., Genève, No. 2445. Made circa 1900. 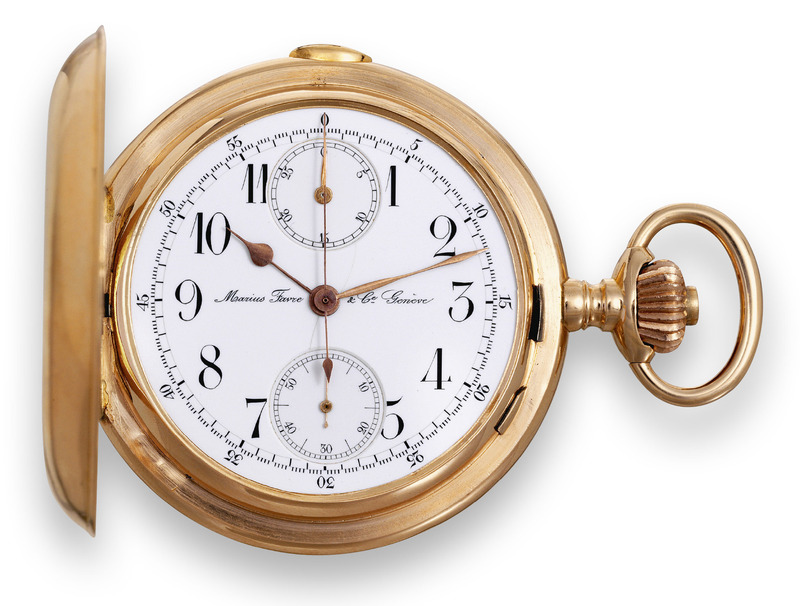 Fine, 18K pink gold hunting cased keyless pocket watch with chronograph and instantaneous 30-minute register. C. Four body massive, bassine, polished. Hinged gold cuvette. D. White enamel dial with large Arabic numerals, outer minute track and fifth of a second chronograph divisions, outermost Arabic five-second numerals, subsidiary seconds and instantaneous 30-minute register. Gold poire hands. M. 19"' movement, rhodium-plated, fausses cotes decoration, 23 jewels, wolf?s tooth winding, straight-line lever escapement, cut bimetallic compensation balance with gold timing screws, blued steel Breguet balance spring, swan neck micrometer regulator, chronograph with visible work. Dial, cuvette and movement signed. Diam. : 53 mm. C. Four body massive, bassine, polished. Hinged gold cuvette. D. White enamel dial with large Arabic numerals, outer minute track and fifth of a second chronograph divisions, outermost Arabic five-second numerals, subsidiary seconds and instantaneous 30-minute register. Gold poire hands.